Tucker scores 41 as Piqua rallies from double-digit deficit to beat Greenville in GWOC American action. Piqua’s Mick Karn fires a pass to Zach Tillman over Greenville’s Noah Walker Tuesday night at Greenville. Piqua’s Garrett Schrubb up a one-handed runner from the lane Tuesday night against Greenville. Piqua’s Trey Richmond shoots over Greenville’s Foster Cole Tuesday night. Piqua senior Qurri Tucker turned in a career performance Tuesday night at Greenville High School. 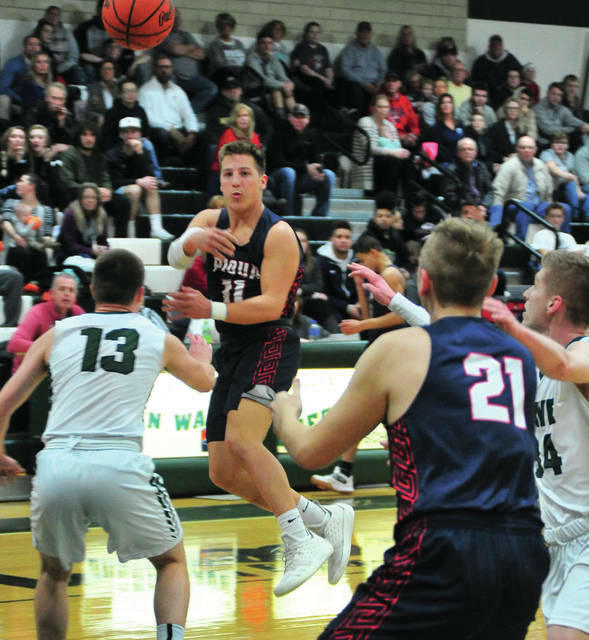 And it took all of that for Piqua to get out of town with an 86-79 victory after a gutty effort from start-to-finish by the winless Green Wave team. Piqua improved to 7-14 overall and 4-10 in GWOC American play, while Greenville dropped to 0-20 overall and 0-14 in GWOC American play. 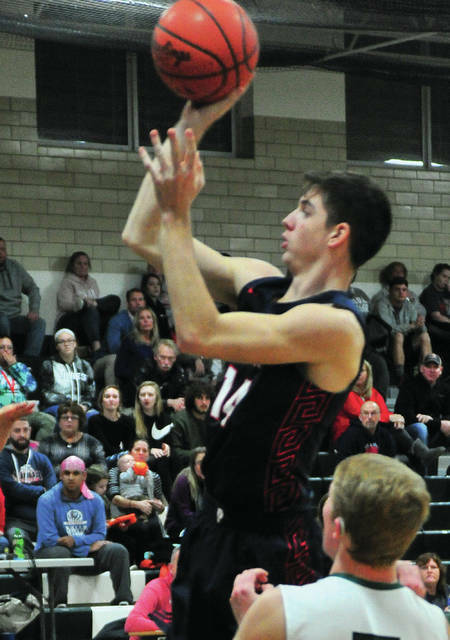 And Tucker turned in just the eighth 40-plus point game in Piqua basketball history and his 41-point effort is tied for fifth, just six points off Bernard Newman’s record of 47. After making 15 of 21 shots from the floor, including four 3-pointers —- and converting seven of eight free throws —- his game tied Mark Matthews and Mick Leffel for fifth best game in school history. Piqua had trailed by as many as 15 points in the first half and still trailed 62-52 with 3:22 to go in the third quarter after two free throws by Greenville’s Tyler Beyke. Tucker scored eight straight points to get Piqua within 62-60 to cap a 15-point third quarter. Trey Richmond had a putback and Zack Lavey was fouled grabbing the rebound of a Greenville miss with 19 seconds to go in the quarter and Piqua trailing 63-62. The bank was open on his first attempt and the second one was nothing but net to give Piqua a 64-63 lead going to the fourth quarter. Greenville stayed within one several times in the fourth quarter, the last time on a basket by Jordan Dill with 6:17 remaining to cut the Piqua lead to 68-67. Mick Karn scored on a drive to the basket and Zach Tillman had a putback to give Piqua a 72-67 lead. Noah Walker hit two free throws with 3:11 to go to get Greenville within 74-71 and Beyke made two with 32.2 seconds to go to cut the Piqua lead to 80-77, before Zach Tillman got a basket at the other end as the Indians finished off the win with a 6-2 run to close the game. Tucker had a perfect fourth quarter to cap his big game. He was 3-for-3 from the floor and 6-for-6 from the line in scoring 12 points. “We just have to learn come out ready to play,” Grasso said about the first-half struggles. Walker scored 15 points in the opening two quarters and Beyke added 12 as the Greenville advantage reached 37-22 midway through the second quarter. A three by Tucker and baskets by Tucker and Tillman got Piqua back within 41-37 before Walker hit an NBA three to put Greenville up 44-37 at the break. “The second half of the second quarter we started to play better,” Grasso said. And the Indians continued the momentum in the second half to rally for the win. Richmond added 14 points and eight rebounds, Tillman had 12 points and six rebounds and Karn had 11 points and five rebounds. Walker led Greenville with 28 points. Beyke had 22 points and five rebounds, while Foster Cole scored 15 points and Marcus Wood added eight. 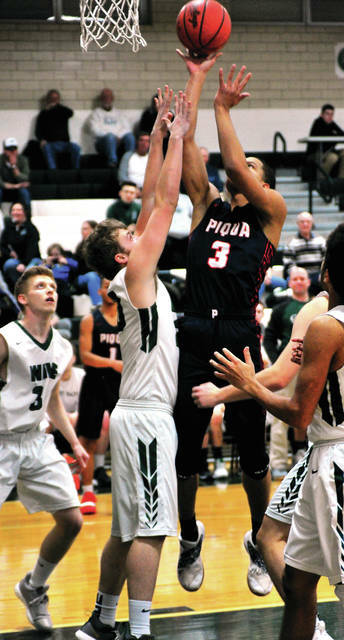 Piqua was 34 of 59 from the floor for 58 percent and 14 of 16 from the line for 88 percent. Greenville was 28 of 55 from the floor for 51 percent and 17 of 20 from theline for 85 percent. Piqua won the battle of the boards 29-22 and had 16 turnovers to Greenville’s 12. The Indians will close the regular season Friday, hosting Troy. With the team riding a career game from Tucker and a comeback from a double-digit deficit. Qurri Tucker 15-7-41, Kameron Darner 0-0-0, Trey Richmond 6-2-14, Mick Karn 4-3-11, Garrett Schrubb 1-0-2, Zack Lavey 1-2-4, Zach Tillman 6-0-12, Iverson Ventura 0-0-0, Riley Hill 1-0-2. Totals: 34-14-86. Marcus Wood 2-2-8, Tyler Beyke 8-6-22, Noah Walker 10-5-28, Cole Foster 5-4-15, Nolan Curtis 1-0-2, Jordan Dill 1-0-2, Reed Hanes 1-0-2, DJ Zimmer 0-0-0. Totals: 28-17-79. 3-point field goals—- Piqua: Tucker (4). Greenville: Wood (2), Walker (3), Foster. Records: Piqua 7-14 (4-10), Greenville 0-20 (0-14). Reserve score: Piqua 60, Greenville 43.